Dennis McGee was born January 26, 1893 in L’Anse des Rougeaux, near Eunice, LA. His parents were John and Amelia McGee. Amelia died when Dennis was two years of age. At the age of 14 Dennis went to live with Theodore McGee. There he listened to Theodore‘s fiddle and learned to love the instrument. Theodore was aware of their love and bought a fiddle for Dennis. Within six months Dennis was playing dances. 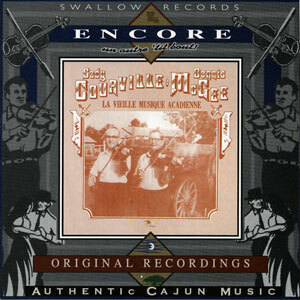 Sady Courville was born in Chataignier, LA on November 15, 1905. Dennis became friendly with Sady Courville, who eventually became his brother-in-law, and learned many old tunes from Sady’s father Eraste Courville. Dennis and Sady recorded many songs together over the years. They eventually traveled to Canada, New York, and Paris to play for several events. Sady passed away on January 3, 1988, and Dennis the following year on October 3, 1989.